Monthly goals disappear in a puff of smoke when I get my teeth into another project. Catching up before the month is over, the last couple of days I have focused on Block 4 of the Tilda fabrics BOM from the Homespun Magazine. This month is made up of a few smaller units... so it is easier to get it done in small chunks. 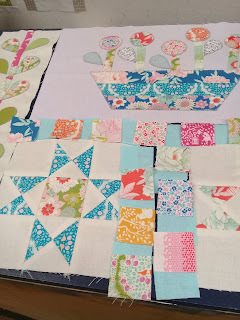 I started with the 6 inch Ohio star blocks (which are probably my favourite block) before getting stuck into the simple applique blocks. If you were to compare this to the magazine original, you would find some differences... but that is the least of my worries and I'm very happy with how things are turning out. Cutting these 1.5 inch sashing squares was a pain in the neck, but I got it done. 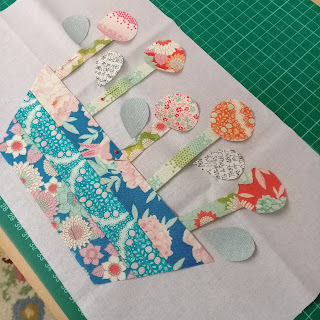 Only one more applique block then I can sew all this together. One more day of school holidays, then back to work on Monday. I can do it! I"m sure you can! Have a fun last sewing day of the holidays :-) It's looking good, by the way! Cutting 1.5" squares is a bit tedious, but worth it for your pretty quilt. Those Tilda fabrics are so pretty Suz. I read somewhere that white backgrounds are bask in fashion after taking a back seat to low volumes and grey we've been using the last few years!